Basket weaving it one of the oldest and widest spread crafts in the history of any human civilization, but it is very difficult to state exactly how old the craft is, because natural materials such as wood and grass decay naturally and constantly. It is worth having a brief look at the history behind this very traditional art. The oldest known baskets have been carbon dated to between 10,000 and 12,000 years old. These were discovered in Faiyum in Upper Egypt. During the Industrial Revolution in the UK, baskets were used in factories and also for packaging and for delivering goods. Wicker furniture became very fashionable in Victorian society and this led to the development of various different uses for it, other than industrial use, such as aesthetically pleasing items – ornamental baskets and sculptures. – ‘Twining’ basketry – material from roots and tree bark. This actually refers to a weaving process, or technique whereby two or more flexible materials cross each other as they weave through some stiffer upright spokes. teaching newcomers to the art, he uses willow. Mainly because it is much easier to manipulate. 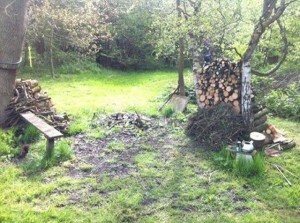 We have sourced the willow that we are using through Musgrove Willows. 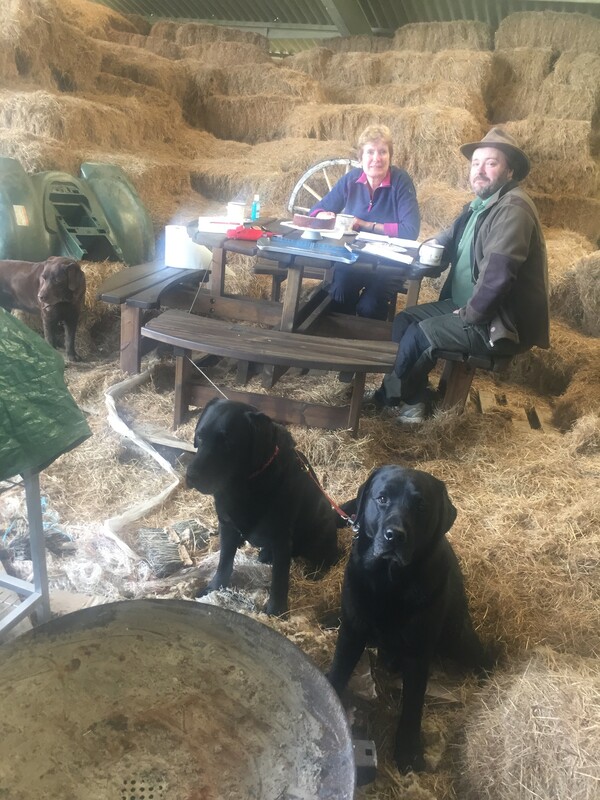 For almost a hundred years the Musgrove Family have been growing willow on the Somerset Levels. It is a renewable and sustainable crop, annually harvested from a stump in withy beds. It is the ultimate green product, absorbing carbon from the atmosphere as it grows. Dave has developed his work from a weaving background to one that weaves itself into the the natural landscape. This is much in evidence in a lot of his work, including the more permanent pieces. Dave insists that ‘impressive structures can be achieved in a day’ for even a beginner. He has been commissioned by many Local Authorities to bring the natural environment into urban town centres by using his sculptures in either wire, or willow. 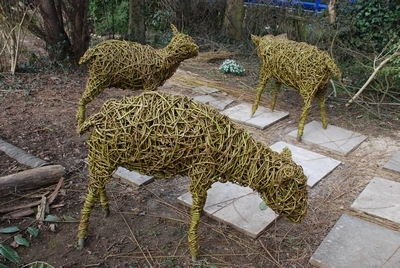 We are hoping that some amazing sculptures will take place at our Al Fresco Willow Sculpture Event at Clue Hill Farm on Friday 3rd July, under the expert guidance of Dave Gosling and Tony Davies. The willow is currently soaking in our pond, for at least 10 days (the pond is fed by natural springs, so the water should be really pure) – this is what Dave has advised us to do. So everything is ready and waiting for the sun to come out and then we can begin! 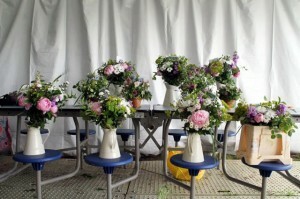 Floral design, or floral arts is the art of creating flower arrangements in vases, bowls, baskets or other containers. It may also include the making of bouquets and compositions from cut flowers. People have been using flowers to lift their spirits for hundreds of years. Studies have show that even the view of a flower, or tree can lift the mood and help an ailing body recover. There are definitely benefits to health by just being near to them. There have been studies at Rutgers University (USA) where they found that flowers had an immediate impact on levels of happiness, in all age groups. Flowers have a long-term positive effect on moods. In particular, the study participants reported feeling less depressed, anxious and agitated after receiving flowers and demonstrated a higher sense of enjoyment and life satisfaction. Flowers can also allow intimate connections. The presence and use of flowers led to increased contact with family and friends. ‘Flowers bring about positive emotional feelings in those who enter a room’ said Dr. Haviland-Jones. ‘They make the space more welcoming and create a sharing atmosphere’. This is applicable to homes, offices, hospitals or anywhere where people tend to gather. This may also be applied to outdoor spaces, but in this instance we have our native wild flowers with their abundance of colour and natural beauty to enjoy. In the hay fields and surrounding woods and paths at Clue Hill Farm we have an abundance of wild flowers. This is primarily due to the fact that there have been no chemicals used there for the past 28 years and that the sheep are our wonderfully efficient natural lawn movers during the winter months, which prepares the hay fields so that they can burst into an amazing pallet of colours as they mature and grow during the months of May and June. 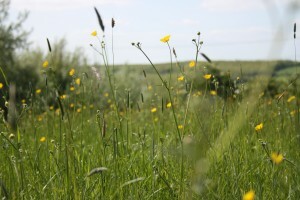 There has been an amazing crop of buttercups this year, which looks stunning in the sunshine. We have the following wild flowers on natural display at the moment: buttercup, wood anemone, bee orchid, red campion, red clover, rosebay willow herb, dandelion, bird’s foot trefoil, yellow iris, yellow archangel, bugle, yellow rattle to name but a few. Wild flowers do not really last when brought indoors and also, should not really be picked. They are better left in the natural environment, for us to enjoy and for bees and insects to make use of. For floral arrangements, the use of natural materials such as mosses, lichens, bark and small branches can really enhance a few garden flowers giving that back-to-nature feel. Our Gift Flowers and Floristry Techniques Workshop is specifically designed to make use of these natural materials that can be harvested sustainably from Clue Hill Farm. 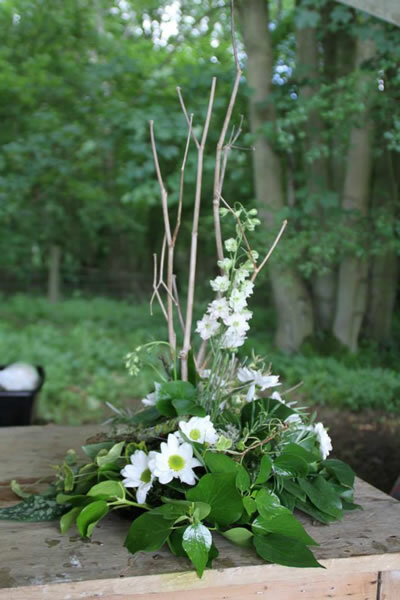 Caroline Wilson and Hazel Harmanour workshop tutors, are passionate about the use of nature’s fruits and have both had many years in the floristry trade where they have practiced this art. 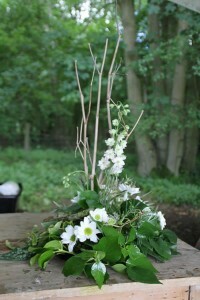 – ensure that your flowers are as fresh as possible when you get them. Even after they are in the vase, the freshest flowers will continue to open up and live fully until the end of their lifespan. 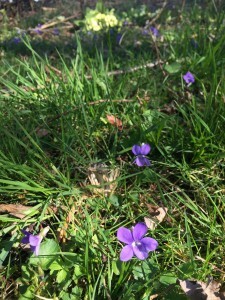 – whilst growing, flowers need water and sunlight, but after they are cut that’s not entirely the case – sunlight plays a vital role in growth, not necessarily in lifespan. In fact, too much heat will restrict the absorption of water, so a hot windowsill in the midday sun may not be such a good idea. Equally, avoid putting them near radiators or fires, or even microwaves. Overnight it is a good idea to put your flowers in the coolest part of the house to ensure that they do not get too warm. It is also crucial not to place them in a draught, or near a door. – to maximise water absorption, put your flowers in warm water, not cold when they arrive. Warm water is easier to absorb and will ensure that the flowers stay fresh. Be vary of adding too much water – flowers only absorb through the bottom of the stem, so only an inch or two needs to be submerged. Ideally, cut your stems across and keep them as short as you can. Shorter stems means the water does not have as far to travel and will make a difference in lifespan. ‘A successful person is not necessarily someone with a lot of money and material goods, but rather someone who is in tune with people and knows how to touch their hearts. I can think of no other item besides flowers that evokes such positive feelings and perceptions for both the giver and the recipient’ M.J. Ryan author of the Random Acts of Kindness books series. 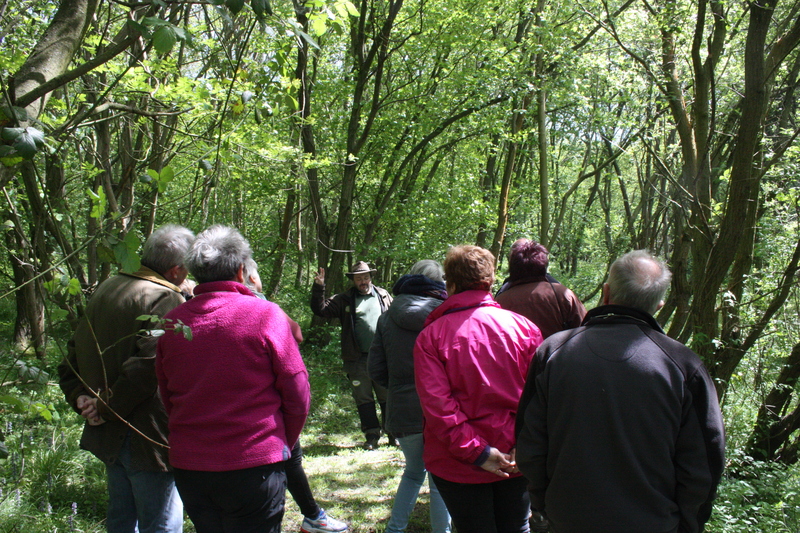 Last Saturday we held our first Wildlife Safari Sensory Workshop with ‘Wildman’ Stuart Mabbutt leading it. This was an opportunity for everyone, myself included, to explore the wildlife secrets of Clue Hill Farm. 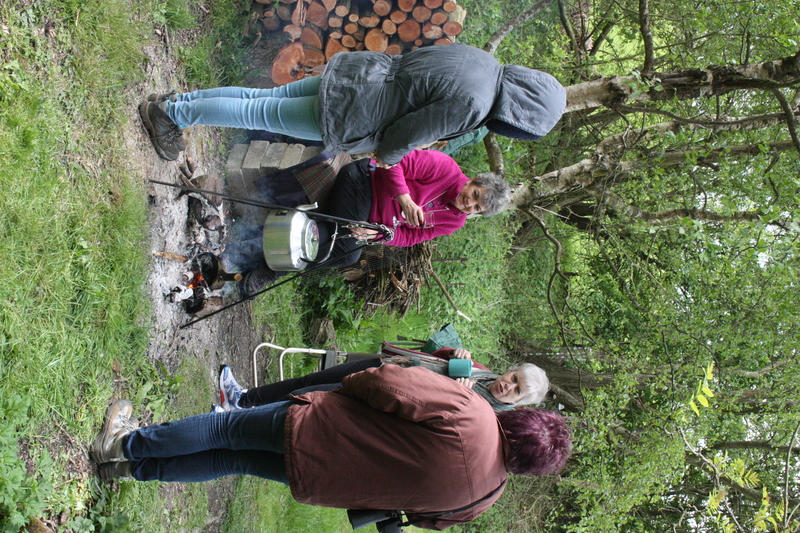 The weather was quite chilly and very windy to start with, which meant that for the first use of our one of our senses: hearing, the dominant sound was that of the leaves rustling in the trees, interspersed with the sound of some very loud chiff chaffs and robins. Almost to order, a Great Spotted Woodpecker ‘clucked’ as Stuart was explaining how we should slightly disengage our hearing in order to be able to listen to everything around us. Our woods abut the Woodland Trust woods of Piddington and by a strange coincidence they were holding a bat survey on Friday night. (We do not fence our boundary between their woods and ours, as this permits the free movement of wildlife). Despite the poor flying conditions on Friday night, the volunteers, led by Stuart Jenking, the Warden managed to find 38 bats in 4 boxes. These were: Common Pipistrelle, Natterer’s Brown Eared Noctule bats. It’s wonderful to know that the Clue Hill pond is the water and insect supply for these nocturnal creatures. You can install your own bat box in your garden, but remember, once it has been installed, you need to get permission from the Bat Society to remove/relocate it, so that its residents are not disturbed. 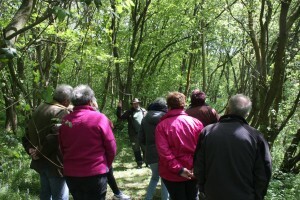 Stuart explained how important dead wood is as an insect habitat. At Clue Hill we like to leave small piles along the woodland edge, some of the larger logs to just decompose and some actually in the pond (half in and half out of the water as it attracts dragonflies and we have these in great abundance in the summer) – just as Stuart suggests we can replicate in our own gardens. The sun then started to shine, looking especially impressive as it came in through the woods creating the beautiful dappled lighting effect. 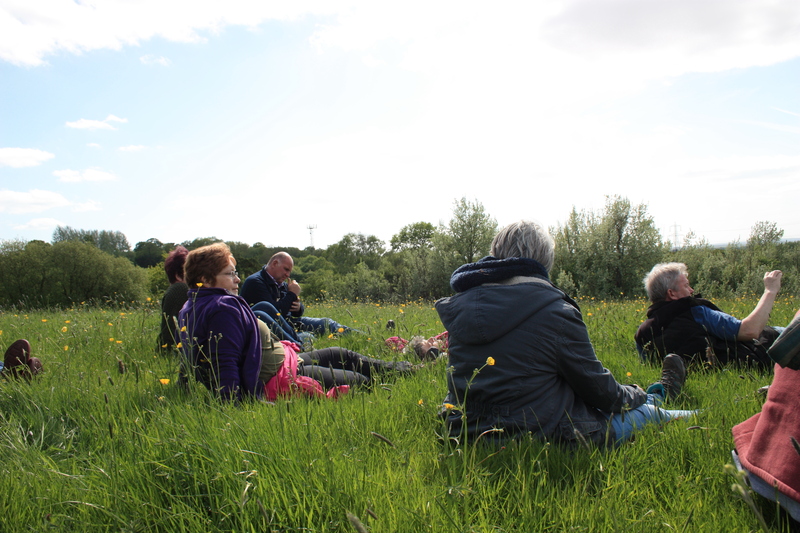 Stuart commanded silence, so that we could all hear the wonderful birdsong and learn how to relax and engage with all that was around us, explaining how different bird species require different sections of the trees to inhabit. Leaving the woods undisturbed is an important part of protecting their habitat. Everyone has been moved by art at some time in their life, whether they consider themselves to be ‘arty’ or not. Art is a form of expression and just as it has been created in a specific frame of mind, so can it influence mood when viewed. Art can also be used as a tool to help people to relax, unwind and take time out from our very busy lives. 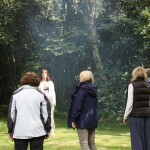 When it is translated into our natural surroundings it can have an even deeper influence. Richard Long, the Land Artist states: ‘I have the most profound feelings when I am walking, or touching natural materials in natural places’. What better way to relax than making an effort to let simple creative expression ease out that inner tension and work you into a state of inspired self-possession? To take time out of a hectic schedule to create a work of art, when you have absolutely no idea where to start, or idea of whether you might even be able to paint, could be quite a challenge for some people. However, if you were to attend a specially designed course: introduction to watercolours you will start to feel more comfortable with your own individual artistic style (there is never a right or wrong way with art – just your conviction that this is how you want it to look). Even better, if you can be inspired by natural surroundings. Often we look at the nature around us, but rarely do we ‘see’ it. There is an unpredictability and uncontrollable nature of watercolour painting that makes it probably the most exciting and expressive medium in art. There is the opportunity to wander somewhere between mastery and complete lack of control during the course of a painting and this is what makes it one of the most engaging mediums. For the first timers, it is useful and insightful to have the benefit of some instruction from a professional tutor, for example: Keith Dunford who is the tutor used by us at Clue Hill Farm. 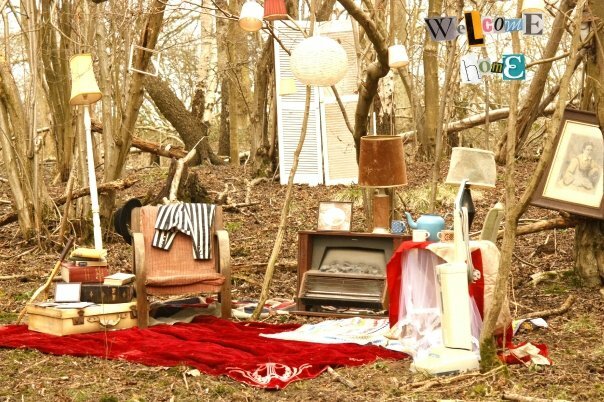 The woods, pond and surrounding hayfields provide the most inspirational back drop for any aspiring artist. If we are more aware of our thoughts, feelings and body sensations, from moment to moment, we give ourselves the possibility of having greater freedom and choice. This takes us away from the old ‘mental ruts’ that may have caused us problems in the past. A good starting point for the beginner is to try to be more open-minded. Perform one new action as an experiment and don’t pre-judge how you will feel until this has been completed. Trying new behaviours can be interesting in itself. Don’t expect things to change over night and don’t expect miracles, but even making a one per cent change in your activity pattern, for example, increasing those activities that nourish you and decreasing those that deplete you, can help in regaining an overall sense of control. When we become anxious and stressed out, we are like cars that are over-revving and it can be difficult to stop the effects that the stress hormone cortisol is having on our minds and bodies. There is evidence that if you have as little as eight weeks of this simple technique of meditation you can reduce the size of the amygdala, which controls our fight or flight response. This means that practitioners of meditation are less prone to angry outbursts and over-reacting to certain situations. There are now several opportunities throughout the country to enroll onto a Mindfulness Course and really get to grips in a safe and controlled environment with the practices of Mindful Meditation, such as our one at Clue Hill Farm. 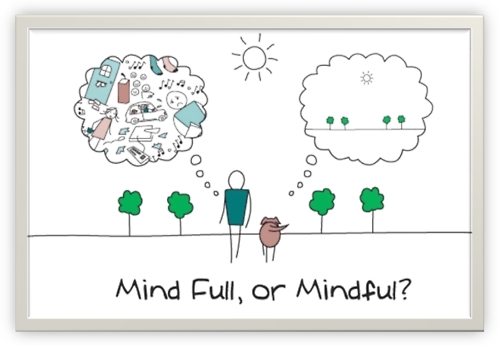 If we can learn how to realize all of the above, then we have succeeded in moment-by-moment mindful awareness. 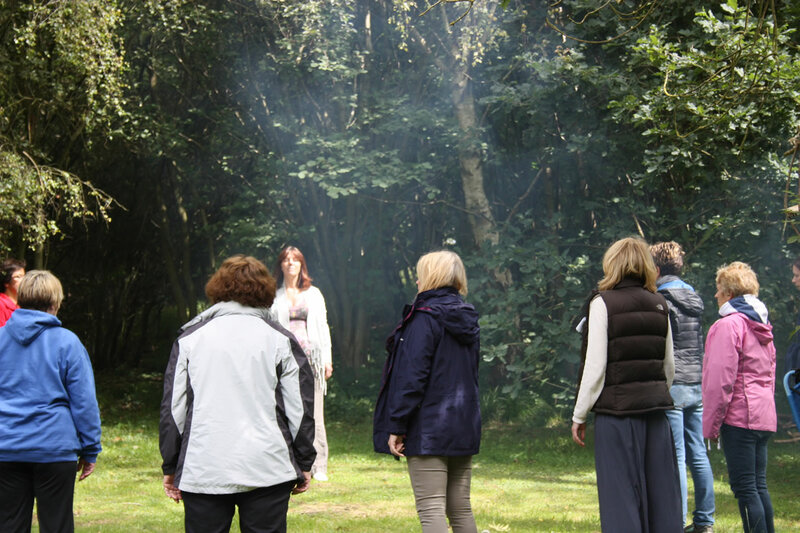 As 2014 moves into autumn then winter, it’s a good time to look back over the creative workshops that took place this summer. 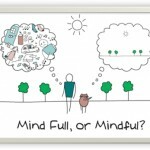 They included topics and activities as diverse as art skills and techniques including pencil drawing and watercolours, as well as flower arranging and, on a completely different theme, mindfulness. 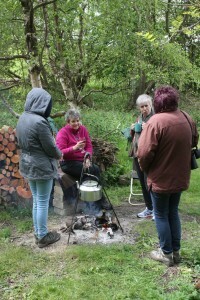 These events have all taken place out in nature at Clue Hill Farm, where participants also enjoyed homemade lunch and other refreshments such as tea, coffee and cakes. The enthusiastic comments we received from participants at this year’s events are a delight to read and, ans requested, there will be more events next year. Our next up-coming event is A Day of Festive Inspiration, which will take place between 10am and 4pm on the last weekend of November.